Clinical and Experimental Dermatology, University of Bradford, West Yorkshire, United Kingdom; *Institute for Pigmentary Disorders in association with Ernst-Moritz-Arndt University of Greifswald and University of Bradford, West Yorkshire, United Kingdom. Restoration of the skin color can be achieved after reduction of epidermal H2O2 levels using topical pseudocatalase cream (PC-KUS)., Recently, we showed that epidermal catalase as well as other affected enzymes recover after treatment with this modality. However, to our surprise, part of our Asian patient population showed only moderate improvement or no response at all. Since Asian cuisine uses a variety of spices, we asked the question whether turmeric (haldi), which is widely used in curries, could possibly contribute to the poor outcome of this treatment. Besides serving as a spice, turmeric is still widely used for wound healing and skin lightening in Asia. It is isolated from the rhizome of the plant Curcuma longa Linn . Its major active yellow pigment is curcumin (diferuloyl methane), which has antioxidant, anti-inflammatory, and anticarcinogenic properties. ,, Curcumin's structure is shown in [Figure - 1]. The oxidation of the two methoxy groups (-OCH3) yields two catechol substituents. This reaction is mostly driven by cytochrome P450. The resulting two catechols are auto-oxidized to semiquinone radicals and finally to orthoquinones. This reaction pathway produces two molecules of H2O2 for each oxidized curcumin molecule. 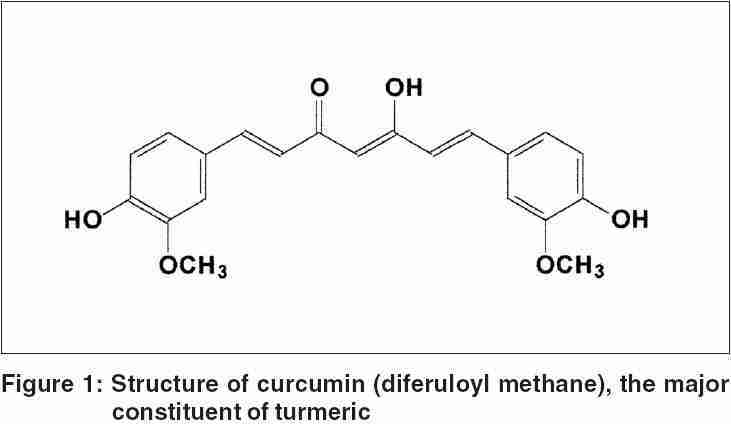 In the presence of low semiquinone radicals, curcumin acts as a free radical trap, explaining its antioxidant properties. However, in the presence of high concentrations, the reactive oxygen species (ROS) generation is over-riding. In this context, it is of special interest that dietary curcumin reaches the skin in mice. 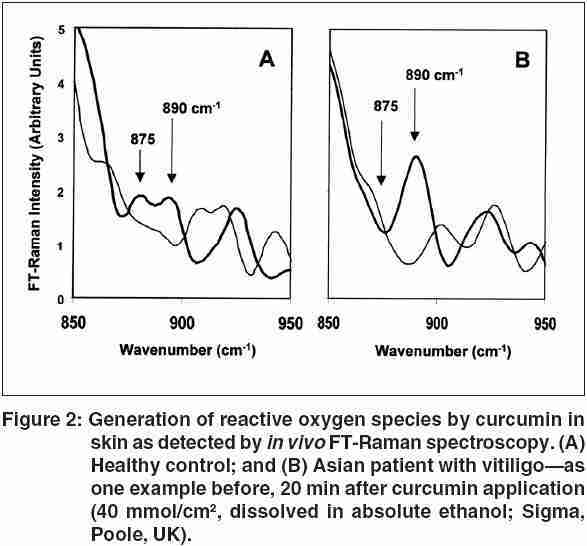 Consequently, we studied the effect of curcumin and its possible ROS generation in healthy skin and in patients with acute vitiligo using in vivo Fourier transform (FT)-Raman spectroscopy. FT-Raman spectra were acquired by using a BRUKER© RFS 100/S spectrometer (Bruker, Karlsruhe, Germany) with a liquid-nitrogen-cooled germanium detector equipped with a fiber-optic cable. Near-infrared excitation was produced with an Nd3+-yttrium aluminum garnet laser operating at 1064 nm. Each spectrum was accumulated over 5 minutes with 300 scans and a resolution of 4 cm-1. All spectra were obtained for the wrist area. The H2O2 was visualised following the O-O stretch at 875 cm-1. The organoperoxides/ROS peak was assigned at 890 cm-1. This in vivo method was approved by the local Ethics Committees.Twenty minutes after topical curcumin application, ROS generation was detected in both normal controls ( n = 3) and patients with acute vitiligo ( n = 3) [Figure - 2]. However, the amount of ROS formation in the skin of the patients was significantly higher compared to controls. This result could be explained as owing to low epidermal catalase levels in acute vitiligo as demonstrated earlier. 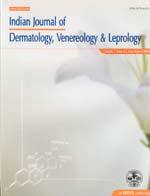 Based on these in vivo results, we evaluated 15 Asian patients with acute vitiligo, who consumed turmeric daily, and their response rate in facial repigmentation after topical application of low-dose UVB-activated pseudocatalase (PC-KUS) twice daily., After 6 months, none of them showed any significant repigmentation. Therefore, we advised eight of these patients to avoid turmeric in their diet and continue the application of PC-KUS twice daily. This led to a significant improvement in the response even after 2 months. After 6 months of treatment, six of the eight patients had nearly complete facial repigmentation [Figure - 3], whereas there was only minor-to-moderate or no response in the seven patients who continued using turmeric together with PC-KUS. In summary, our in vivo results show that curcumin can contribute to the oxidative stress in acute vitiligo and prevent repigmentation. Dermatologists and other doctors treating patients with vitiligo should be aware of this possible problem.